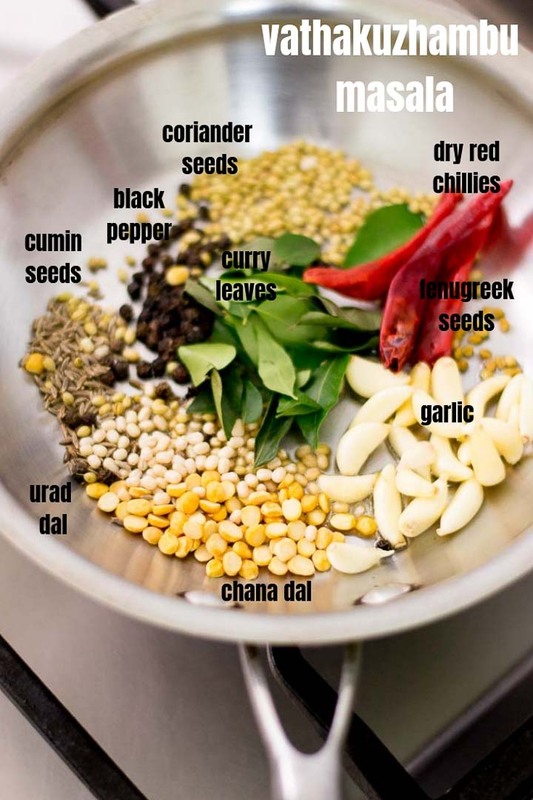 Recipe for sundakkai vatha kuzhambu. 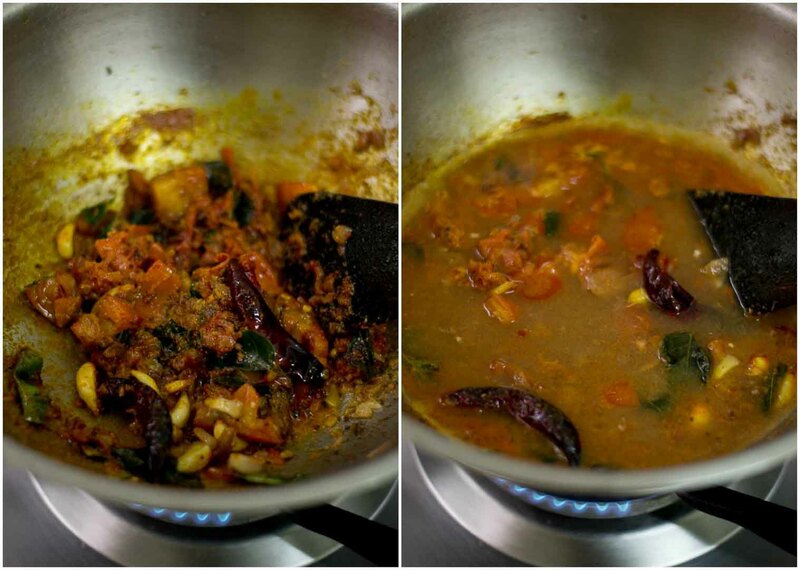 Spicy Tamil style vathal kuzhambu / kara kuzhambu recipe made without coconut. A popular side dish for lunch in Tamilnadu. Sundakkai is also called as turkey berries. The fresh berries are soaked in a salt-buttermilk mixture for couple of days and then dried and stored for making curries. Its easily available in Indian grocery stores or online. First, we will fry the sundakkai. Take a pan and add in three tablespoon of oil. Add in the sundakkai and saute on a low flame for a minute. The berries will puff up and start to change colour. 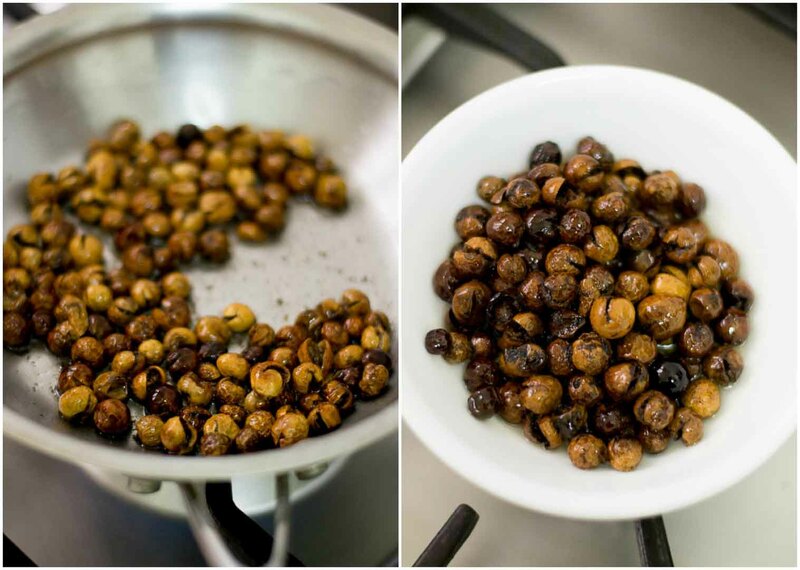 Remove from heat and set aside to a bowl along with the oil left. 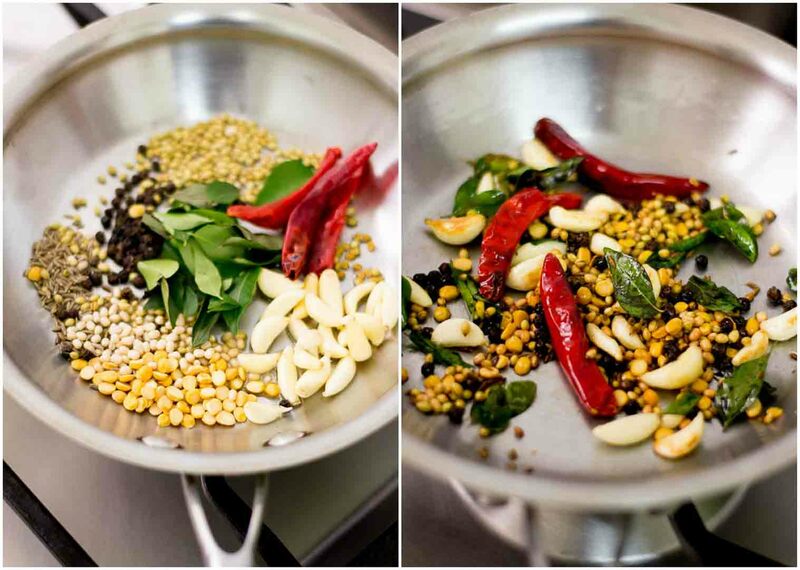 Now, we will make a fresh masala paste. Here is what you will need. 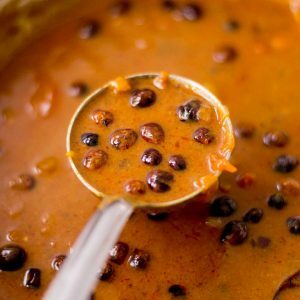 Use very little fenugreek seeds as they are very bitter. 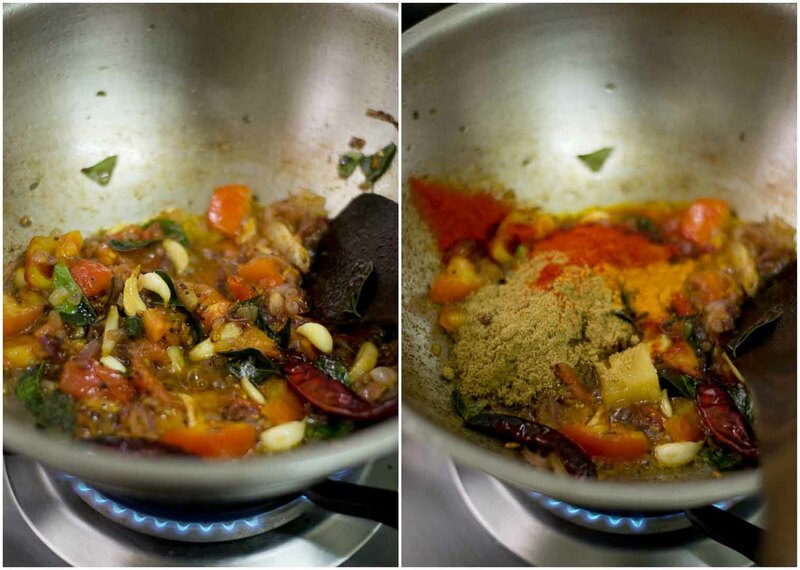 Heat a teaspoon of oil in a pan and add in all the ingredients for the masala paste. Saute on a very low flame for 3-4 minutes. Sauteing on a low flame is important as you do not want to burn the lentils. Sauteing on a low flame nicely roasts and browns the ingredients. Grind the roasted ingredients along with half a cup of water to a smooth paste. Set aside. 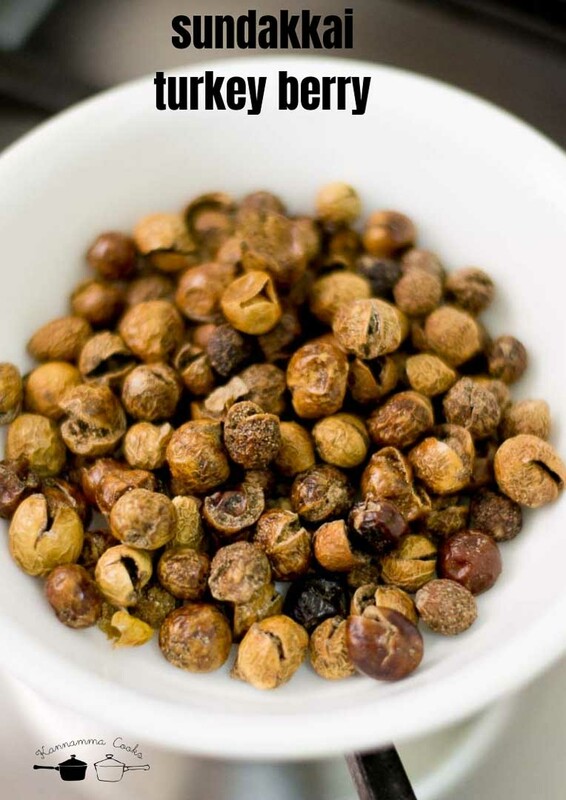 Soak a gooseberry size tamarind (about two inch strip) in a cup of water for 20 minutes. Squeeze and extract the pulp. Discard the seeds and the pith. Set aside. Now we will make the kuzhambu. 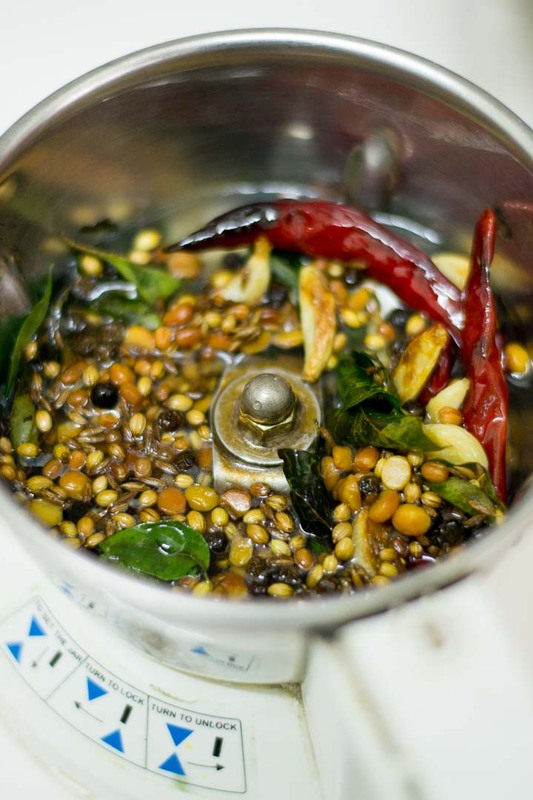 Heat peanut oil in a pan (Be generous with oil) and add in the mustard seeds, fenugreek seeds, fennel seeds and curry leaves. Let the mustard seeds crackle. Add in the chopped small onion (Indian shallots) and garlic. Saute for 3-4 minutes. Add in the chopped tomatoes and saute for a minute. Now add in the turmeric powder, red chilli powder, coriander powder and jaggery. Saute the masalas for a minute. Add in the tamarind pulp. Add in the salt and the ground masala paste. Note on salt Dried sundakkai is already salted. When added to the curry, the salt from sundakkai will also be released in the curry. So go easy on the salt and if need be, seasoning can be adjusted later. Wash the mixie with half a cup of water and add back to the pan. Add in a cup of water too. Let it come to a boil. 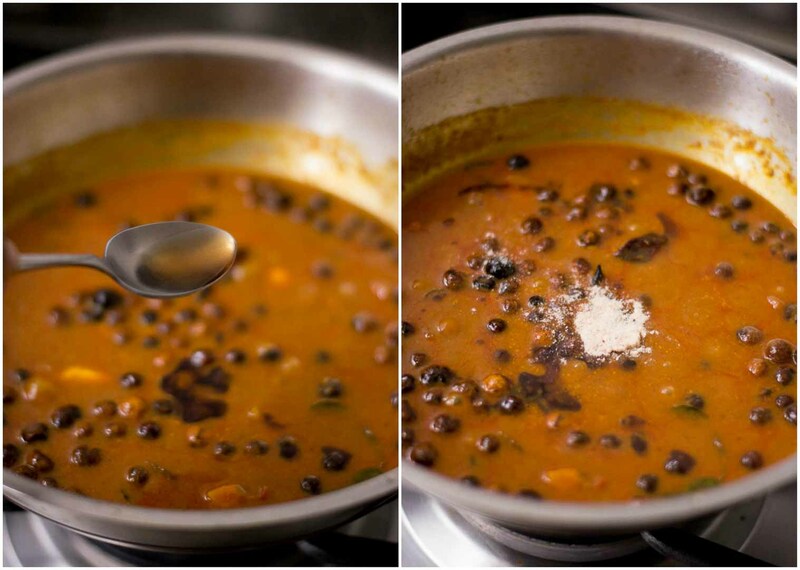 Add in the sundakkai along with the oil and allow it to simmer for 20 minutes on a low flame. Check for seasoning and add more salt if necessary. The salt in the dried berries vary from each brand. So adjust salt if necessary now. 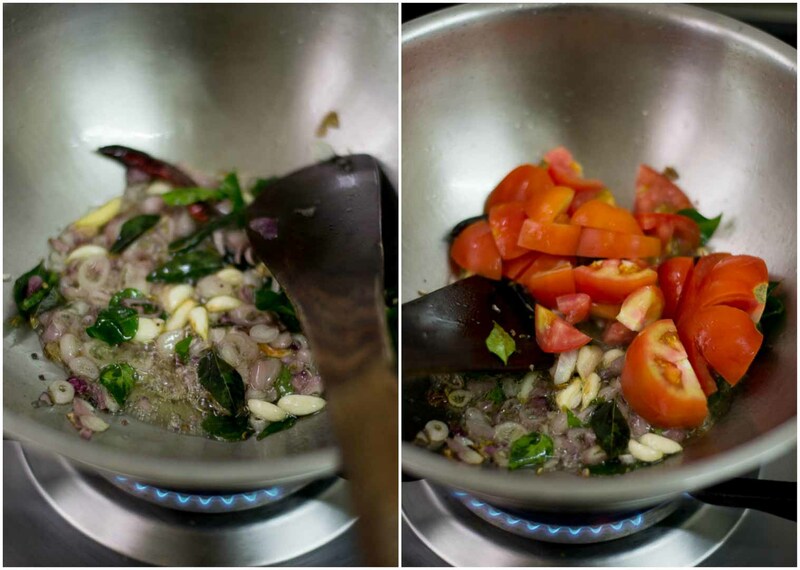 Switch off the flame and add in two teaspoon of Indian sesame oil (gingely oil) and a big pinch of asafoetida powder. 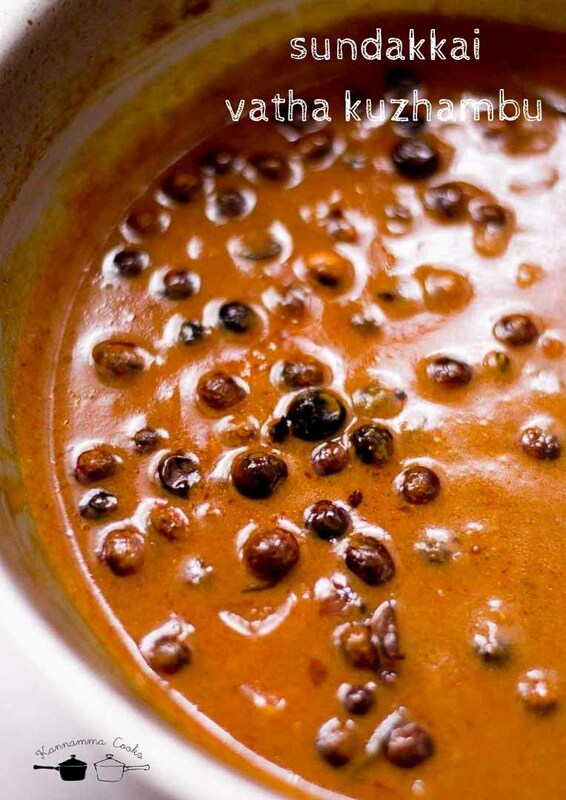 Mix well and set aside for half an hour so the berries soak up the juices and nicely flavour the curry. Serve hot with rice. The kuzhambu tastes best the next day! Take a pan and add in three tablespoon of oil. Add in the sundakkai and saute on a low flame for a minute. The berries will puff up and start to change colour. 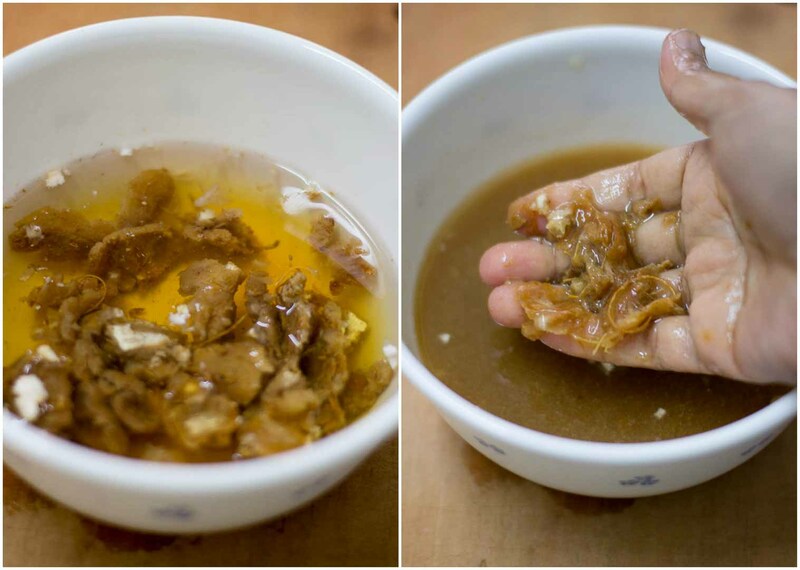 Remove from heat and set aside to a bowl along with the oil left. 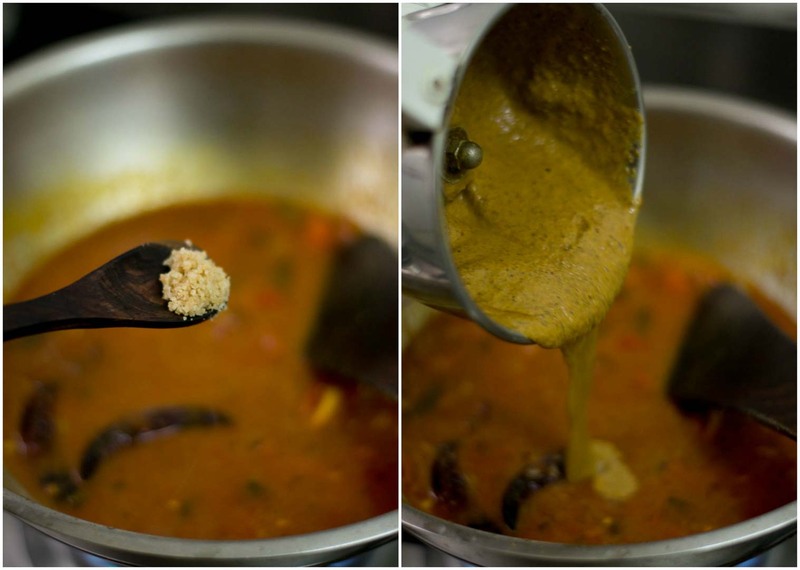 Heat a teaspoon of oil in a pan and add in all the ingredients for the masala paste. Saute on a very low flame for 3-4 minutes. 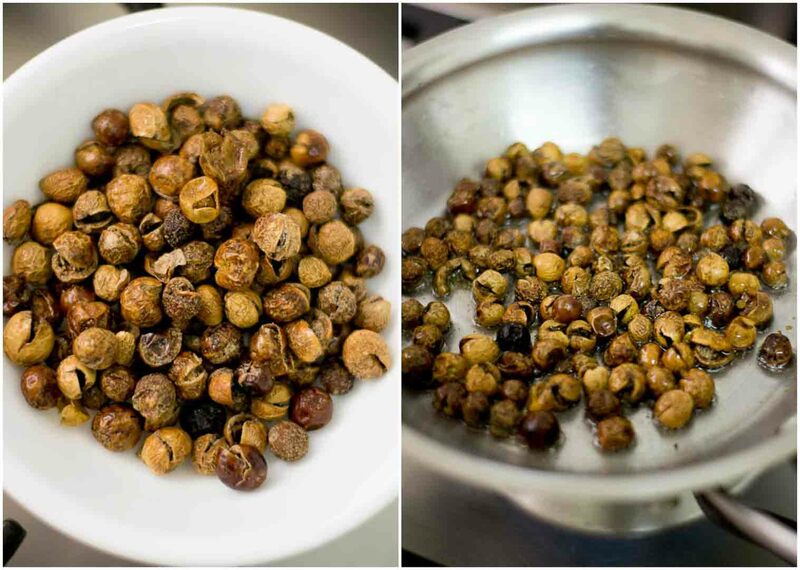 Grind the roasted ingredients along with half a cup of water to a smooth paste. Set aside. 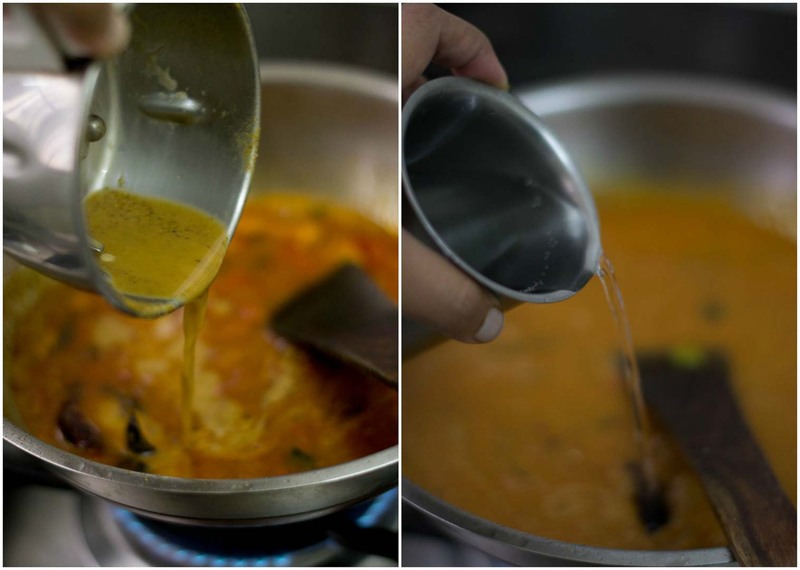 Add in the sundakkai along with oil and allow it to simmer for 20 minutes on a low flame. Check for seasoning and add more salt if necessary. 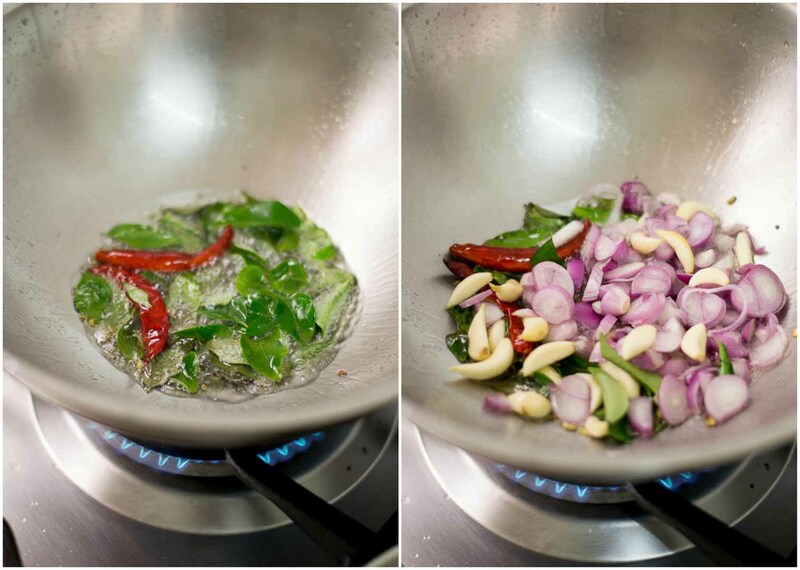 Switch off the flame and add in two teaspoon of Indian sesame oil (gingely oil) and a big pinch of asafoetida powder. 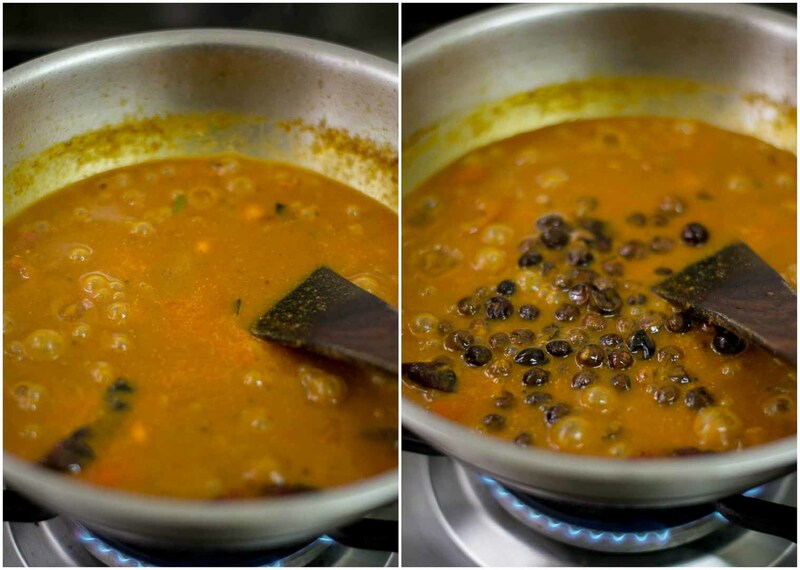 Mix well and set aside for half an hour so the berries soak up the juices and nicely flavour the curry. Dried sundakkai is already salted. When added to the curry, the salt from sundakkai will also be released in the curry. So go easy on the salt and if need be, seasoning can be adjusted later. I am a big fan of vatha kulambu. 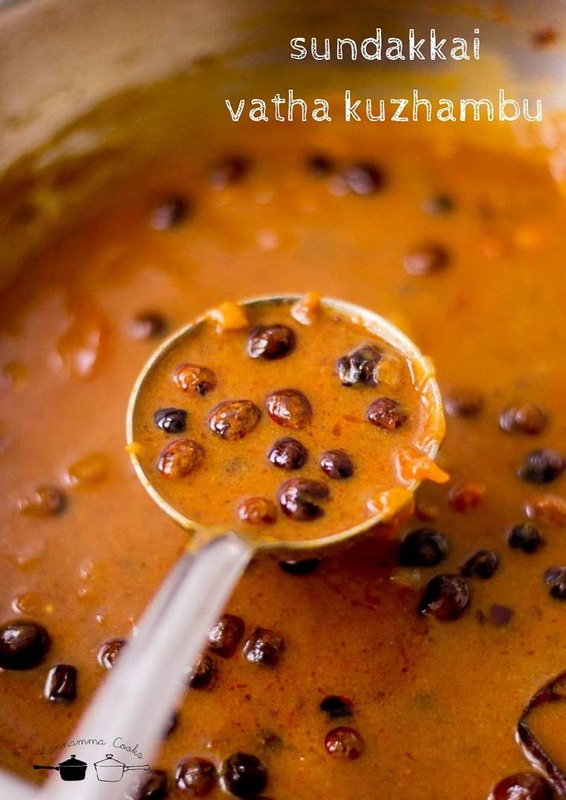 I have tried many vatha kulambu recipes but it didn’t came out well. Recently I came across your recipe and thought of giving a try. Really it turned out well. It was so yummy. Thank you for the recipe. I am an amateur but cook like a professional because of you. Love this recipe. Turns out great every time. Every recipe of your that I have tried has come out so fabulous! I have family requesting me to cook dishes these days and bring. THANK YOU SO MUCH !! I will make this as i have noted down in my recipe book. Thank you for this recipe.